My first green smoothie recipe led me to another green smoothie, and another, and now they are my favorite drink of choice. When I started drinking green smoothies I noticed that I felt better, had energy to start my day, and was happy that I could put so many raw foods into a smoothie than I could ever sit down and eat. I felt nourished and satisfied. Variation: Replace the water with cashew milk for a different and delightful twist. Here are guidelines for your smoothie: Feel free to modify it any way you like depending on what is in your refrigerator. Basically, a green smoothie consists of at least 40 percent green, fresh leafy vegetables. Some of these are wheat grass, lettuce, kale, spinach, watercress, endive, celery, chard, romaine, alfalfa (or any type of sprout), parsley, mint, beet greens, Brussels sprouts and collard greens. etc. I also also add wild edible greens to my morning green smoothie. 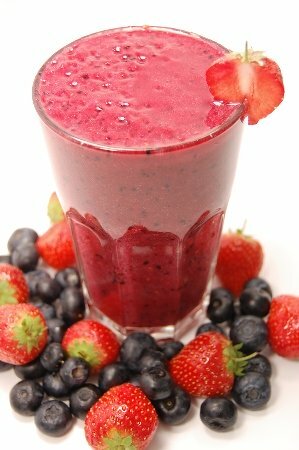 The other 60 percent of the smoothie is fruit such as berries, citrus fruits, peaches, bananas, pears, and others. Place the greens and fruit into your blender with about ½ cup of water, ice cubes, some raw sweeter if desired, a generous dash of cinnamon and blend until smooth. So what exactly makes them so good? They are full of organic and fresh fruits and vegetables. However, the beauty and power lies primarily in the abundance of the green, leafy vegetables. Usually, when drinking a green smoothie, you are consuming more greens than you would normally do even if you eat a salad every day. The raw, natural chlorophyll in the greens is a powerful nutrient. Chlorophyll has many powerful health benefits. For starters, it is rich in the mineral magnesium. The high levels of magnesium in chlorophyll may be the reason why drinking green smoothies helps to lower the sugar cravings. Many times, sugar cravings are a direct result of a magnesium deficiency. When you feed your body magnesium, your cravings quickly fade away. I had a huge bunch of cilantro that I needed to use, so I did some research and developed the following recipe. It was not my favorite, but this recipe should be included with other healthy smoothie recipes. After I made this and gulped it down, I felt as though I had the energy and endurance to take an eight mile hike! Just a warning: Cilantro does have a very strong taste, but it is so very good for you. Place the ingredients in the blender in listed order. Blend until smooth. Drink, then go for a hike (hike optional). After making this recipe, I wanted more healthy smoothie recipes. Here are a few more. Remember you really cannot go wrong making smoothies. Use these healthy smoothie recipes as guides to create your own smoothies. Drain your veggies in a colander and then chop them into smaller pieces. Firmly pack the container about ¾ of the way and then add purified water. Blend for at least one minute to break up the cellular walls and enjoy! She adds this about her green smoothie recipe: "Because of the proliferation of toxins in the world, aging due to free radical damage has placed the majority of people on this planet on an accelerated aging path. 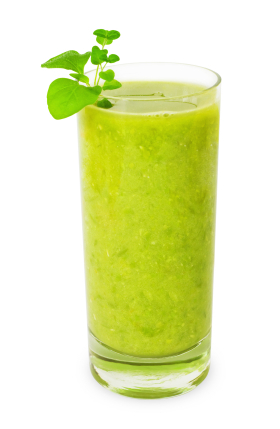 This green juice combats the free radicals, preventing early degeneration of the body." These gourmet green smoothie recipes are served at the Red Mountain Resort in St. George, Utah. Credit these recipes to Executive Sous Chef Michael Girardot. Rotate your greens. It is good to obtain the different nutrients you obtain from different greens. If you use more greens than fruit in your green smoothie recipe, your green smoothie may have an “earthy” taste. Adding vanilla extract or a banana will "cut" the earthy flavor. Use a high powered blender and blend for several minutes to avoid lumpy smoothies. My personal green smoothie recipe collection (I make up these green smoothies recipes based on what greens and fruit are in my refrigerator!) has helped me to lose a little weight, they have also helped me to maintain a good percentage of a raw food diet. Green smoothies are easy, economical and practical. 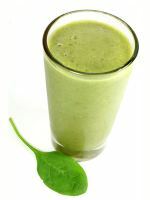 A green smoothie is real health food, which gives positive results quickly, easily and they taste good too. As long as you have a blender, some organic leafy greens and fruits, you have no reason not to eat more raw foods.